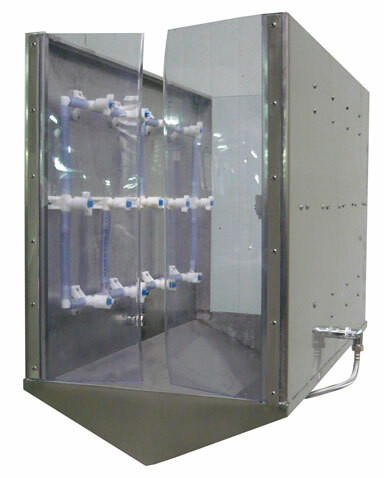 The suspended spray carcass washer is designed for washing hens and chickens in poultry processing lines. The spray carcass washer is made of stainless, acid-resistant materials. Carcasses are washed by water spraying from nozzles placed on both sides of the washer. Water nozzles produce water mist which reaches deep into the carcasses. This results in perfectly washed carcasses, and water is used in an economical and effective way. Capacity of the spray carcass washer is adjusted to the line capacity by using appropriate number of water nozzles and length of washer. Different washers can be constructed with different lengths, e.g. : 1,000 mm. This is a chicken size washer. For larger poultry, such as turkey, the washer must be adequately bigger.